2 pieces of fabric - 6" x 7"
I found that making a template and drawing a pattern was an easy way to cut the vinyl. I tried just cutting with my cutting mat and ruler and it kept slipping around. 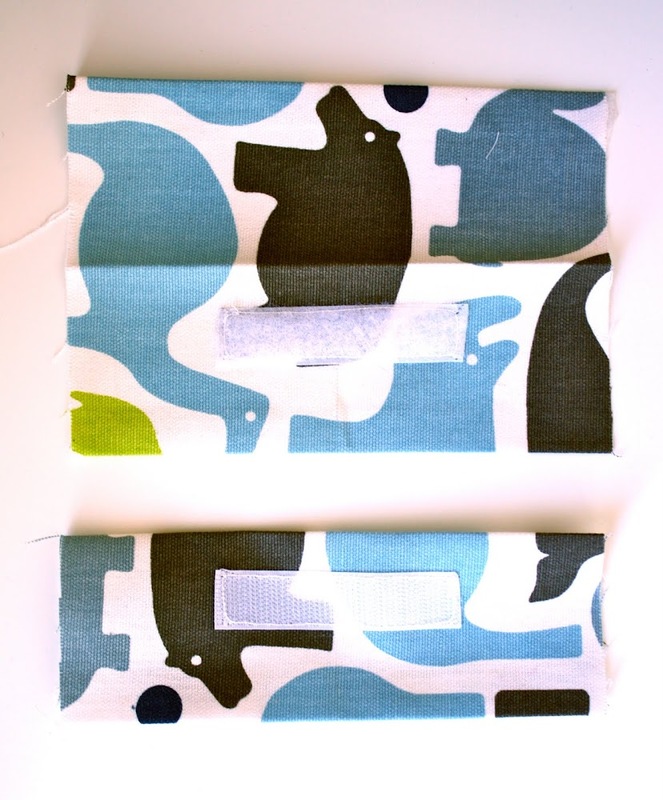 Next, take your fabric and fold it in half, matching the shorter sides, so you have a rectangle that is 7" wide by 3.25" tall. Press. Open, and fold down the long sides 1/2". Press. Open up the folded fabric and center the hook and loop tape about 1/2" from the top. Sew in place making sure you sew through only 1 layer of fabric ie. you should be able to re-fold the fabric and not see the seam lines on one side. 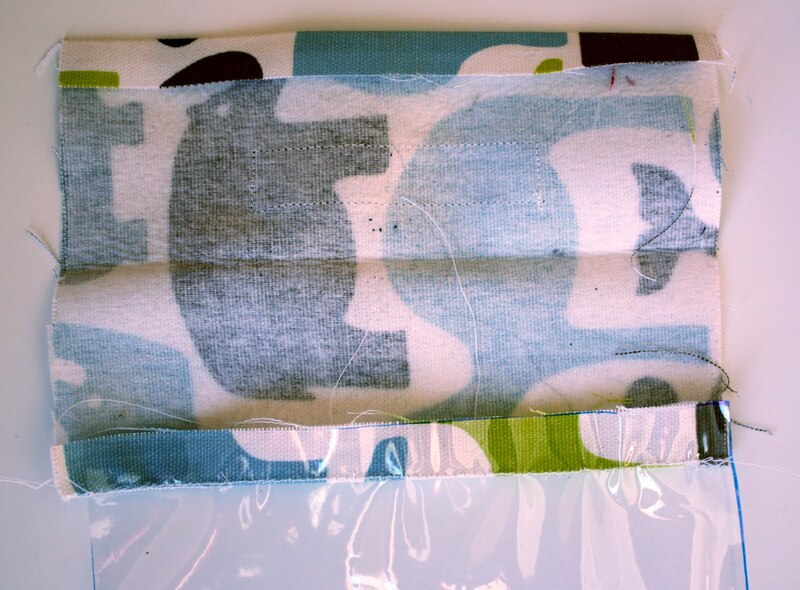 Open up folded fabric (bag top) and align raw edge with the 7" side of a vinyl piece. Sew across, with seam allowance just short of 1/2". Turn so that the seam allowance and raw edge of the vinyl is sandwiched between the fabric top. Topstitch along the top and bottom. OK, now grab your bias tape, we're almost done. Take one end of the bias tape and fold the edge to the inside. Press, refold, and press again to create a finished end. Starting at the top end (fabric end) of one side of the bag (sorry, I didn't get a photo of this part), sew all the way down to the bottom. When you get to the bottom, turn the bias tape 90 degrees as pictured. Fold the tape over again and create a mitered corner. Sew along the bottom and repeat for the next corner. When you get to the top of the bag, cut the tape and make a finished end as you did at the start. Just make sure you leave enough bias tape so that when you fold the end, it still comes all the way to the top. Done! Fill with toys and enjoy. I love this!!! I am headed to the fabric store tomorrow!! Great job! I love these...so professional looking too and so easy! Thanks for sharing! 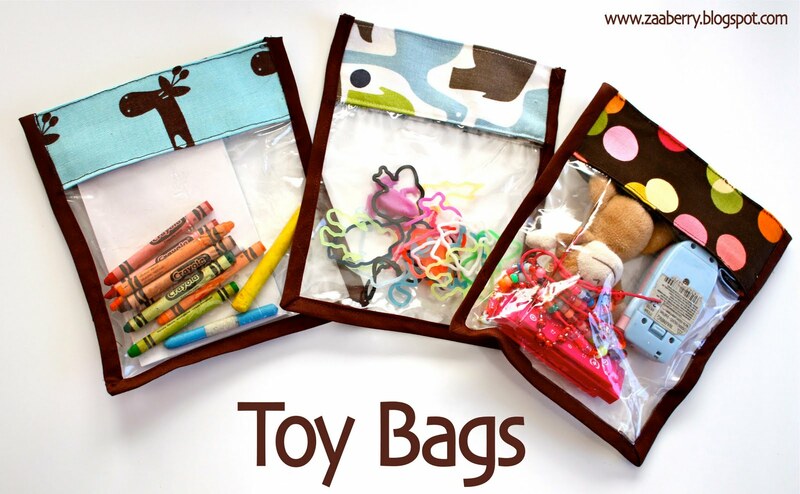 This is a great idea and they don't have to be for toys... just think of of the little "stuff" that one could organize! these are soo awesome! uhm, ok I cant sew to save my life but I would gladly BUY some from you! let us know if you should decide to start selling them, I think you are onto something here! awesome! I will have to try these! great tutorial! Thanx for sharing!!! love these Ruby!! Will be trying them as soon as I can get some vinyl...where did you find it? LOVE this idea! My girls are 7 & 9 and still love to put their little collections in bags, so this is perfect. How clever is that? I love the fabric you used! Great idea! Reusable and very cute too! I'm going to try these to make travel bags for my girls; we're going on a road trip this weekend. I think I'll be lazy and just sandwich the plastic in between the layers of the fabric, instead of sewing, flipping and sewing again. I'll also skip the topstitching, since the bias tape should do a nice job holding everything together. Thanks for the great idea! I will have to make these soon!! My kids are always loosing their small toys :) ty for posting and sharing!! This is such a great idea. Thank you for sharing Ruby. I can't wait to try these out! My little girl is constantly asking for baggies, too. What a fantastic way to recycle those bags that everything seems to come in from bedding to onesies! AND, it uses up little lengths of bias and fabric - my kind of project! Thanks for thinking through a way to sew vinyl without having to sew ON vinyl, which is a nightmare for my machine. LOVE it, LOVE it! ...and a perfect way to use up some of my favorite fabric scraps! fantastic tutorial - what a great idea!! I just thought of something- I am going to make a bunch of these SO when I cut the fabric, I am going to cut a 7" strip of 44" fabric. Then I am going to iron the fabric in half so I have a folded strip (3.5x44) then I will iron in the raw edges and last I will cut them to the size of my bags. I just popped over from Made By Rae to check out this awesome tutorial. I wish I could pick your brain about your biochemical research on the effect of environmental chemicals on child development. 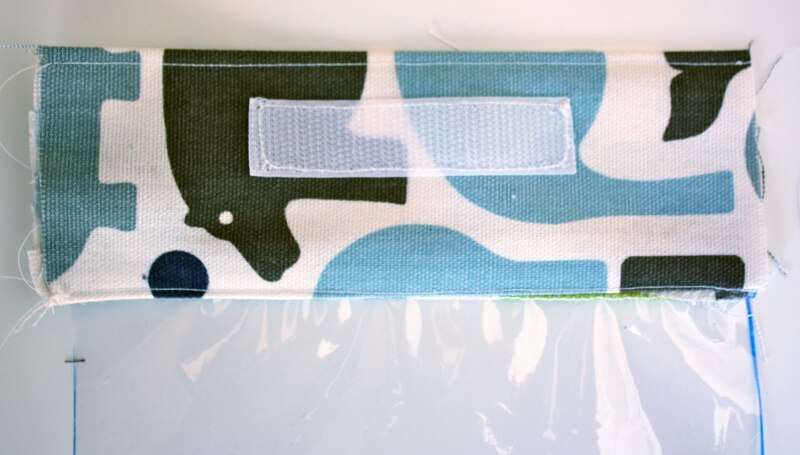 This tutorial got me thinking about making reusable snack and sandwich bags for my toddler. Still trying to figure out what the safest, food grade material would be for food-storage bags. These are adorable! I have never tried sewing vinyl, but I'd love to try with this. very cute. love the vinyl, so you can see what is inside!! thanks for sharing! Great idea! This is a must try. Thank you for sharing! I'm visiting from Made by Rae. Thanks for this idea, I think this would be a perfect way to organize my diaper bag. This is SSOOOO great! My kids have dozens of little "things" that we just pile into a box and then can't find when we need them. (They're treasures, Mommy. Don't throw them away!) Argh! Thanks for such a handy and simple tutorial! These are so cute! Every time I've tried sewing with vinyl it's been a disaster. It ends up all warped and wonky. Any tips for successful vinyl sewing? These are great! Just today my kids were asking for ziplock bags to put toys in. I tried to make it a "reuse" project, so I used some vinyl from a bag a comforter came in. (Thanks to my MIL, just happened to have one today when we went to visit) Great directions, I made one while my kiddos were napping and finished a second one just a few minutes ago. Thanks! Love this, I imagine bunches with a grommet in the corner so you could put them on a book ring, or hang them on hooks too! Love your tutorials!! Thanks for sharing!!! My kids are always "stealing" ziploc bags for hotwheels and other random toys- what a perfect solution. So many practical and cute uses! Craft supplies, perhaps? Thanks for sharing your great ideas! Came here from Made by Rae. Love the tutorial! Very handy & easy :) Thanks for sharing!!! These are great. I'm already thinking of so many things that they would be good for. Love that they are see through. Thanks. I LOVE this, too cute! And I can't wait to make some, I'm thinking these would be great for all those little Barbie shoes & combs I'm always stepping on or pulling out of the dog's mouth. *hehehe* Thanks SO much for sharing!! I have several airplane trips coming up and hate the clear bag I bought for my liquids, the plastic zipper never stays together. This would be perfect! These would also be great (if made a little bigger) to use as "wet bags". It never failed when I went out with my babies (I have five) that I would always have something wet to bring home ... cloth diaper, dirty bibs, drooled on onesies ... and I always had to search for something plastic to put them in so they wouldn't wet things inside the diaper bag. Oh! Am I going to be gifting these things or what?!!! Thank you for the tutorial!!! I finally made some of these and blogged about it! Your blog is fantastic and refreshing, thanks for sharing your creativity. Thanks for the tutorial. I just finished making a couple of them to coral a few small items in my diaper bag!! Great tutorial and pictures! I love it! I am featuring it on my blog today! 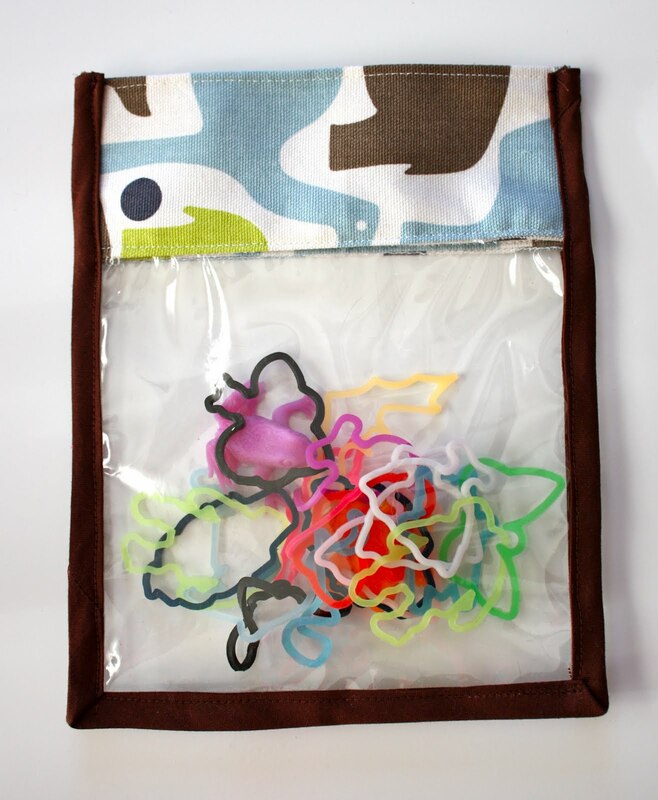 With the velcro rather than hard-to-close zips for little one these are a great idea for the classroom. With the addition of using the bags Sarah talks about and adding the grommets from Annonymous they will be fantastic for all the games pieces and such. These are very wonderful bags that you've made for your kids. It's ingenuity at its best! I'm new follower. Love this idea and the fabric you used are so cute. A must-have. Thanks for sharing!!! I remember how me and my mom used to do crafts together. She taught me how to saw and make dress for my dolls. Now I teach my daughter the same thing... its important that we spend quality time to our kids and projects like this are really handy. How about using heavy weight FREEZER bags for the vinyl? Obviously food safe to make snack bags. I'm making some for my pregnant daughter who is very 'green' (both environmentally and physically at present!) and always needs a snack handy. An excellent Chritmas stocking stuffer and small gifts for my annual ornament exchange! I am making these bags for my daughters up coming baby shower. I thought they would be great for her diaper bag. I have adjusted the sizes for different items. Love your idea and thank you so much for sharing. Just found you from Pinterest, clear bags with the fabric edges...a million uses comes to mind...Thanks! I love this idea. Such a pretty way to dress up plain plastic bags. I am going to make up some for my grandchildren for all those tiny Lego pieces. What a great idea and wonderful tutorial! Thanks! Nice idea, thanks. I think I am going to make some to separate stuff in my purse: one for makeup, one for bandaids and wetwipes, coupons, etc. Maybe then I can find things faster. Then I'll make some for my 1-year-old great-grandaughter so I will have them when she needs them. This is great i was even thinking that you could velcro the back and stick them on a board it would be so colorful and handy. Thanks for posting this I will add it to my list of things to do, to help me organize!!! What a good idea I will use it in my french country, thank you! These are great! I whipped one up last night and I'm pretty sure that I'll be making a few more! Oops, how rude, I meant to say thank you so much for a great tutorial! Do you sell these on Etsy??? Or any of the things you make?? I'd love to sew, if I didnt hate my sewing maching!! LOL Its kindof a love/hate relationship I have with it. Wow just found this, brilliant! Mom's everywhere thank you!!!!! Great tutorial ! I just made one for my stuff and it turned out great (my tablecloth didn't appreciate but whatever...) Thank you ! I'm OFF! Thank you so much for sharing....I am always amazed at how simple, yet apparently hard to think of myself, these ideas are from you crafty people....God bless an dkeep on thinking and sharing! These are just perfect. My kids also love using plastic bags for their toys, and I think the durability here makes so much sense! You've given me another project for my to-do list :). I have a birthday to take my sons to tomorrow and it is always hard to come up with something to sew for little boys. I think I will fill a few of these with Hotwheels. Thanks for the tutorial. These are great! I am thinking about making them a bigger size to keep costumes/dress up clothes & their accessories together! Maybe with a vinyl pocket on the front for a picture of the costume from the original packaging or a photograph of the costume on my kids! Should that be 1/2 YARD of bias tape, not 1/2" (inch)? No it's 1/2" wide and comes in a package that's about 2 1/2 yards. Great! And if you continue the bias binding up in a loop, you can make it into a handle, which my own GD loves. Just loves to hand things everywhere. It's a great idea, thank you ! !